If I told my kids to stop eating bread, noodles, pizza, white potatoes, rice, and sweets, they’d think I was nuts. Let’s hope they don’t become diabetic. Every day I see diabetics who find it difficult to follow a diet low in sugar and simple carbohydrates. Yet following such a diet would lessen the need for diabetic medication – not to mention decreasing the complications of diabetes. 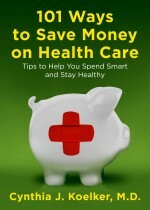 Not only can people with diabetes save by eating properly, pre-diabetic patients may be able to ward off the disease. Avoiding these 10 foods is a good place to start. 1. White bread. The processed flour turns to glucose almost as quickly as sugar itself. In fact, white bread is rated the same as glucose on the glycemic index. The glycemic index is a ranking according to how quickly a particular food raises blood glucose levels. High is bad, low is good. Both glucose and white bread are rated 100. Stone-ground whole wheat bread and pumpernickel bread have a much lower glycemic index. 2. White bagels. They look a lot like white bread, don’t they? The yummy bagels are much higher in calories than regular bread, too. 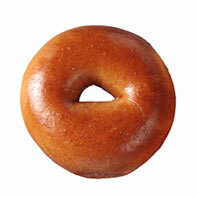 Two slices of bread equals about 150 calories whereas a good-sized bagel is twice that. Not that you can’t eat bagels, but get a whole-grain variety and remember that eating a big bagel is like eating 4 slices of toast. 3. Saltine crackers. If you were the baker, you’d notice that white bread, white bagels, and crackers all start off with white flour. The same is true of standard pretzels. Whole grain crackers and pretzels are better for diabetics and non-diabetics alike. 4. White potatoes. Strangely, sweet potatoes have a lower glyemic index and raise the blood sugar less than white potatoes do. 5. White rice. Are you noticing a pattern here? Some diabetic patients choose to avoid anything white. 6. Most breakfast cereal. Unless it’s made with whole grains, breakfast cereal, too, will be processed like sugar. Even quick oatmeal raises blood sugar. Stone-cut oatmeal is much better for you and is now available in standard grocery stores, right next to the “regular” oatmeal. However, the stone-cut variety takes much longer to cook, easily half an hour or more to soften the grain to the consistency of regular oatmeal. 7. Instant pasta or macaroni mixes. Almost anything “instant” or processed breaks down into sugar more quickly than the natural forms. 8. Popcorn. Yes, another white item – however, amount is the key. A cup of popcorn (unbuttered) won’t raise your blood sugar much whereas eating a large theater popcorn is like eating a few candy bars. 9. Sweet fruits. The especially sweet fruits like watermelon and pineapple contain more fruit-sugar than the less sweet fruits, but again, amount is the key. A few bites won’t hurt you. 10. Alcohol. Not only does it elevate your blood sugar, but it may impair your judgment regarding your diabetes. Best to avoid alcohol altogether. Billions and billions . . . but why limit this to diabetics? This entry was posted in Diabetes, Diet, Nutrition and tagged Blood sugar, Diabetes mellitus, Eating, Endocrine Disorders, Glycemic index, Pancreas. Bookmark the permalink.